Riding the right -- or wrong -- technology wave can help -- or really, really hurt -- your business. Moving at the right time can be the critical factor between the two outcomes. Yet new technologies come down the pike at alarming speed. Deciding which will fizzle and which will sizzle -- and when -- can be a daunting and ongoing task. 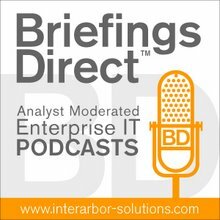 What’s an enterprise architect to do? Forrester Research has tried to sort things out with a new report, “The Top 15 Technology Trends EA Should Watch.” And, if even limiting the selection to 15 sounds like a lot to keep your eye on, Forrester has grouped them into five major “themes,” and has ranked the technologies by their impact, newness and complexity. Calling “impact” the most important criterion, the report says this considers whether the technology will deliver new business capabilities or allow IT to improve business performance. “Newness” comes in second because it’s likely that enterprises will have to gear up to learn new processes and the processes themselves are prone to rapid evolution. “Complexity” places other demands on the business, requiring more time to learn operations that are more complex than others. The technologies range from real-time business intelligence (BI) with a very high impact, high newness and high complexity to data- and content-based security, which scored a medium in all three categories. I guess that'll keep my friend Jim Koblielus busy for some time. Forrester limited the report to a three-year horizon for two reasons. First, it represents the planning horizon for most firms and, second, any technology that won’t have an effect in less than three years may be interesting, but it’s not actionable. The report also says that we're entering a new phase of technology innovation. This analysis is based on Forrester’s finding that technology change goes through two waves. The first involves innovation and growth. This features a rapid evolution of the technology and rapid uptake by businesses. The second phase is refinement and redesign, in which technologies are only incrementally improved. I hear a lot these day about "inflection points" in the IT market. I hear folks point to the hockey stick growth effect coming for netbooks/thin clients/desktop virtualization/Windows 7. I like to add the smartphones and Android-phones to that category too. And even if the cloud is a slow burn, rather than hockey stick, the importance of business processes supported by services supported by all the old and new suspects is huge. I call the ability to refine and adapt business processes as the big productivity maker of the next decade --- supported by IT as services. Perhaps the new Moore's Law is less about systems, and more about what people do with the services those systems enable. What do you think? Incidentally, the full report is available for download from Forrester.